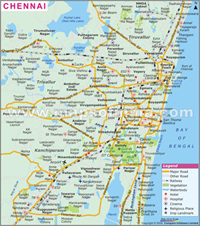 Chennai is the biggest city in TamilNadu and it is located on the south eastern coast of India. The city was previously known as Madras and it was established by the British Government. In the beginning Chennai was known as Madras Patnam, it was located in the region of Tondaimandalam. Chennai is located near the 13th north parallel and 80 degree longitude. Chennai city had a total population of 4.34 million in the 2001 survey within the area administered by the Corporation of Chennai and an extended Metropolitan Population of 6.5 million.Although the city itself was recognized only in the 17th century by the British Government, some of the cities like Mylapore predate this by several centuries. The British on settling developed it into a major town centre and naval base. By the 20th century, it had become an important governmental centre, as the capital of the Madras Presidency. Chennai's economy has a wide manufacturing base in the car, technology, hardware manufacturing, and healthcare industries. In this Chennai city is India's second largest exporter of software, Information technology (IT) and information-technology-enabled services (ITES). A main portion of India's car manufacturing industry is based an around the city. Chennai district contributes 39 percent of the State's GDP. Chennai accounts for 60 percent of the country's automotive exports. Chennai is the main center for Carnatic Music and hosts a large cultural event, the annual Madras Music Season, which includes performances by hundreds of artists. India’s one of the largest film industries Tamil film industry, is based in the city. The Many most important international airlines have usual direct flights to Chennai, Like as Air India, British Airways, Lufthansa, Singapore Airlines, Air Lanka and Malasia Airlines. Almost all other worldwide airlines have direct flights to either Delhi or Bombay. Indian Airlines has daily flights from Chennai to Bombay and Delhi and most International Airlines will arrange the domestic flight booking with Indian Airlines to Chennai, if you decide to catch their flights to either Bombay or Delhi. Chennai is linked to all main cities in India by air, train and road network and it make the smallest village easily reachable through comfortable trains and deluxe buses. Monsoon: Chennai monsoon period is from October to mid-December. Season: Tropical throughout the year. Languages Spoken: Tamil, English, Tamil, Hindi, Urdu, Malayalam are widely spoken and understood. Educational Institutes: Dr.Ambedkar Law University, SRMC Chennai, IIT Madras, LIBA Chennai etc..